Week in, week out at More Music I see, hear and feel how singing is good for us. Just this week I’ve been to the wonderful Lancaster and District Schools’ Singing Festival and heard young people’s voices joyfully raised up. Most days our home in Morecambe resounds to harmonies, young people trying out songs and lyrics, beatboxing, rap, vocal looping. I’ve been off at a meeting of Greater Manchester music education and arts organisations discussion national plans for singing in music education. I’m running a session at our base in More Music on this very theme of the wellbeing benefits of sharing a song. 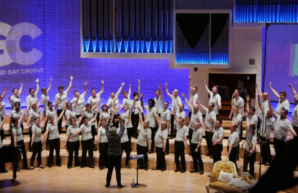 For all of us who have worked with singing, whether that is community choirs, individual coaching or vocal training know the benefits of raising up the voice. So many times people have come up to me after a session or a performance to tell me how taking part in song has changed their lives, given them confidence, helped with anxiety. Choirs often refer to each other as family, a group that is supportive way beyond keeping a bass line secure. But it can be difficult to prove those effects wider than individual stories. There is a growing body of evidence. For example, the ‘What Works Wellbeing’ briefing on music, singing and wellbeing found there is proof that “targeted, culturally relevant music and singing interventions can enhance mental wellbeing and decrease depression in older people with chronic conditions”. They rated the evidence as ‘promising – which we need to investigate further’. I’m happy to say at More Music we are starting work that is going to be part of that investigation. We are partnering with the Spirit of 2012 Olympic legacy programme to create sessions both with young and older people to advance this research. We are working with health providers in a way that is genuinely ground breaking for an arts organisation in the UK. Of course it’s true that many types or activity have health benefits. But there is something very particular about song, particularly in groups. What can be a fear of ‘getting it wrong’ or ‘I only sing in the shower’ can turn to the power of discovering a shared community, a sense of belonging, finding your voice in both a literal and a metaphorical sense. So come and join us, there are plenty of opportunities with us here in Morecambe and further afield. Also, tell people that it matters, if you can, support our work. Let’s get voices raised across the country – that thought definitely makes me feel good.